Painted in 1964. This work is being considered for inclusion in the forthcoming Mark Rothko Online Resource and Catalogue Raisonné of works on paper, compiled by the National Gallery of Art, Washington, D.C.
Atlanta, High Museum of Art and Savannah, Telfair Academy of Art, Georgia Collects, January-March 1989, pp. 181 and 215 (illustrated). 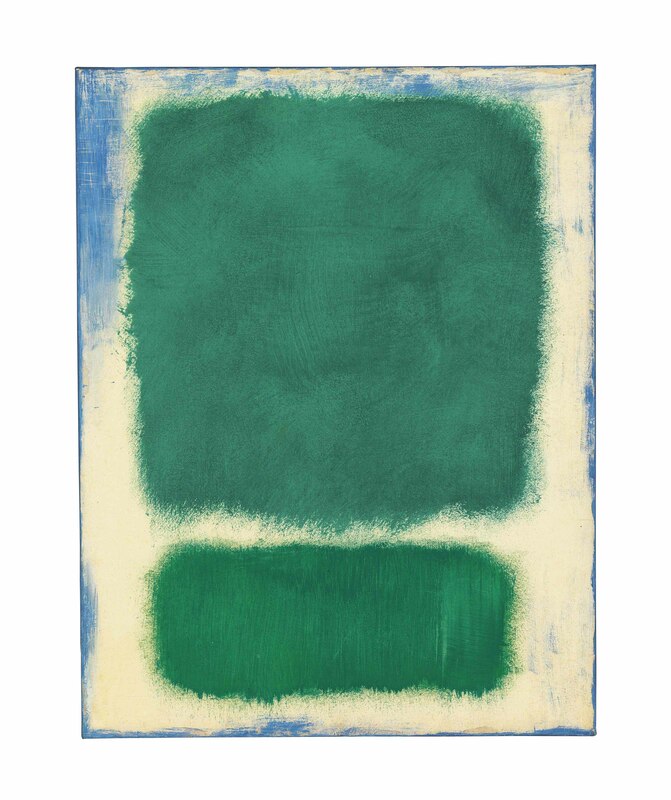 With a luminous field of emerald set within a soft, ivory border, Untitled draws the viewer into the depths of Mark Rothko's unique pictorial language. Its endearing qualities, however, are not only found in the transcendent composition and gracefully applied layers of color, but also in the dedication on the reverse. Inscribed there, the words "to Mary Lasker" reveal that this work on paper was fondly made as a gift for a tireless philanthropist, noted art collector, and the artist's dear friend. This enchanting piece embodies a special friendship, as well as Rothko's desire to communicate human emotion through the subtleties of space, light and color. Although it is easy to be consumed by the rich expanse of green, embedded blue hues, and milky shades of white, Mark Rothko warned that to only appreciate his works for their handsome aesthetics would be a mistake. Throughout his career he maintained a commitment to profound content stating, "I'm interested only in expressing basic human emotions - tragedy, ecstasy, doom, and so on. If you . . . are moved only by . . . color relationships, then you miss the point!" (Mark Rothko as quoted in "Notes from a conversation with Selden Rodman, 1956" in Writings on Art: Mark Rothko, 2006 edited by Miguel L©opez-Remir). In its gem-like scale, Untitled offers an intimate experience that fulfills the artist's goal of infusing his paintings with feeling. Only kept in two private collections since its creation in 1964, the spiritual vision and breath-taking skill with which the artist fashioned the current lot, has been flawlessly preserved. Rothko's first one-man exhibition, which was held in the summer of 1933 at the Portland Museum of Art, was composed exclusively of works on paper, the predecessors of Untitled. Sharing characteristics with his canvases while exhibiting their own exceptional qualities, Rothko's works on paper are significant to a richer understanding of the artistry he developed over the course of his career. Working with this medium allowed Rothko to evolve his technique from that of a young artist, into the iconic colorfield style that would afford him permanent recognition as one of the greatest twentieth-century painters. Even when the artist switched to his well-known domineering canvases, the lessons learned from his earlier creative investigations on paper remained apparent. Watercolor was Rothko's media of choice in the mid-1940s when he worked a great deal on paper. His familiarity with the effects of watercolor on paper greatly influenced the fluid painting technique and atmospheric effect he would later develop in his classic canvases. Whether it was applied to canvas or paper, Rothko uses paint to gesture towards the range of experiences that can be inspired by a carefully crafted medley of sweeping color and illusive form. In Untitled, two narrowly separated rectangles of glowing emerald pigment are stacked one on top of the other. The viewer's gaze is pulled beyond the flat picture plane containing these luminous shapes, by turning edges completely painted in a rich blue. Rothko's intentional painting of the turning edges gives the otherwise planar form of Untitled a unique sculptural dimension. Because of their smaller size, Rothko was able to work with paper from a closer vantage point, allowing him to exercise greater control over the symmetry and surface of the finished composition. The velvety green that lends this work its alluring aura, has precedent in some of Rothko's earlier creations, such as No. 5/No. 24, and No. 212. In all of these paintings, color and form are inseparable, the forms themselves are made from color alone and appear to float metaphysically within space. Variations in saturation and hue evoke a mystical realm that offers the viewer both layered depth and intimate meaning. Untitled radiates optimism, freshness, and vitality, a far cry from the somber tones that characterize Rothko's canvases of the same years. The present work included, many of the artist's works on paper, with their glowing pigments and vivid palettes, stray from the narrow range of colors which dominate his canvases during the sixties. Rothko's use of bright greens, blues, oranges and reds, was driven by the newly popular and available acrylic and Magna paints. Rothko indulged in curiosity and tested the effect of these lively pigments on paper, with compelling results. Untitled stands out amongst a surrounding sea of dark canvases, yet its composition makes it easily recognizable as a product of a cultivated Mark Rothko. "In the two soft-edged and rounded rectangles of Mark Rothko's mature style there is an enveloping magic, which conveys to receptive observers a sense of being in the midst of greatness. It is the color of course." (Duncan Phillps as quoted by Jeffrey Weiss, Mark Rothko, 1998, p 248). The present work is a striking and intimate example of both artistic curiosity and the time-honored classical Rothko style.